Pay the registration fee from one of the available modes of payment (online or AP centers). Click on “Make Payment” and proceed to further steps by providing the mandatory details. After successful payment of the registration fee ‘Payment ID’ will appear on your computer screen. Note down payment ID and proceed to “Application Form” filling process (only after payment of fee). Fill the details such as the candidate’s name, address, qualifying examination, SSC or 10th class hall ticket number, stream or test centre, caste certificate, minority/non-minority, Adhaar card number, etc in the application form. Upload the signature of size less than 30kb and passport size photograph of 50kb in .jpg format. Click on “Save and Preview” and submit it. Take a printout of the application form after submission of application form. The candidate may visit any of the AP LAWCET 2018 Online Centres with mandatory details in hand including hall ticket number of their qualifying exam (12th Class or Degree exam), the name of the candidate, candidate’s father’s name, candidate’s Date of Birth, Hall ticket number of 10th Class exams and Mobile Number. Candidate needs to pay the requisite fee and obtain a receipt for the same, ensuring that the receipt contains a Transaction ID. With the Transaction ID in hand, candidates should click on the “Click here if paid through AP LAWCET Online” button on the ‘Registration Fee Payment Procedure’ page. Here, the candidates should enter their AP Online Transaction ID, their name, Mobile Number and Date of Birth. 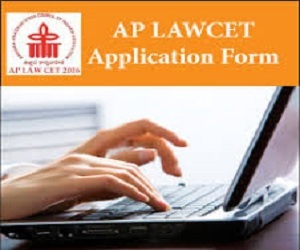 The final step is to click on the ‘Proceed to Online Application form filling’, which will lead the candidate to the page of AP LAWCET 2018 Application Form. With the necessary card details in hand, the candidate may click on the “Click here to pay online using your Debit card/Credit Card/Netbanking” button on the ‘Registration Fee Payment Procedure’ page. Candidates will be redirected to the payment gateway page where they may select the card type (VISA, MasterCard or Maestro) enter their details including the number on the card, valid thru date/year, name on the card, CVV number and security pin. Once entered, click on the ‘Make Payment’ button. Candidates are requested not to click on the Back/Refresh buttons or to close the browser page abruptly while payment is in progress. Once the payment is successful, a Payment Reference ID and a Transaction ID will be generated and displayed on the screen. Candidates should make note of these and proceed to fill the AP LAWCET 2018 Application Form by clicking on the ‘Proceed to Online Application Form Filling’.